Merseyside's local elections are a turf war - and I mean actual turf. The green stuff, the fields, parks and even bits of unloved scrub-land will be the area's local election battlegrounds on 2 May. Many green spaces are likely to be developed for housing as the Labour-run councils try to find space for enough new homes to meet demand, but in Wirral and St Helens, the plans have proved particularly contentious, as green belt sites could be used. The issue could cost Labour seats across the region. The Local Plans, long term forecasts for how many houses need to built and where, have opened up swathes of land for development. 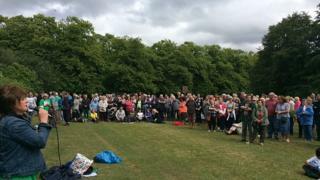 There have been noisy protests outside council meetings in Wirral and St Helens, costly legal battles in Liverpool and a huge U-turn in Knowsley when plans to sell 17 parks were scrapped after public outcry. Labour insists it is being forced to earmark green space for housing due to government targets, but opposition parties claim Labour simply doesn't care about what might be lost. On Merseyside and in the Halton corner of Cheshire - which is, confusingly, also part of the Liverpool City Region - it is Labour who hold sway, mostly with significant majorities. The party and main rivals the Conservatives are fielding candidates in every ward. The Tories are the leading opposition group on Wirral Council and have a small group of councillors in Sefton, St Helens and two in Halton. Interestingly, the Greens are fielding a higher number of candidates than the Liberal Democrats in total across the area. This is possibly due to the green space campaigns, but also many voters have not forgiven the Lib Dems for going in to coalition with the Conservatives in national government. Wirral is the one to watch though, as if Labour lose just two of their 35 seats, they lose their majority. The council will then be in no overall control, as it was for a decade between 2002 and 2012. Wirral Labour's been increasingly split in the last couple of years, with claims that an influx of "hard left" members have pushed out long standing councillors. Four Labour councillors quit the party recently and set up their own independent group and council leader Phil Davies is not seeking re-election, leaving Labour campaigning without being able to tell voters who will lead them after 2 May. Across the Mersey, Labour has a huge majority in Liverpool under the leadership of the city's mayor Joe Anderson. However, doubts about his future and the unpopularity of some of the developments he has been linked with mean some Labour candidates are publicly disagreeing - on the doorstep and on social media - with some of the decisions his administration has made. The Lib Dems, who ran the council until 2010, are hoping to make gains this year, but it is a steep mountain to climb, as they have eight seats to Labour's 75. The last time these seats were up for election, Labour was the only party represented there, but now there are three Liberal Democrats, a Green and an independent. Will voters decide the grass is greener away from Labour?